The entire phylogenetic Order of bats, Chiroptera, is one of the least understood within the world of mammals (Class Mammalia). The UC Hopland Research & Extension Center has a very small study skin collection of various bat species found in the local area. One of these is a fairly large bat with a wingspan of almost 16 inches ... and it is called the Hoary Bat eus). 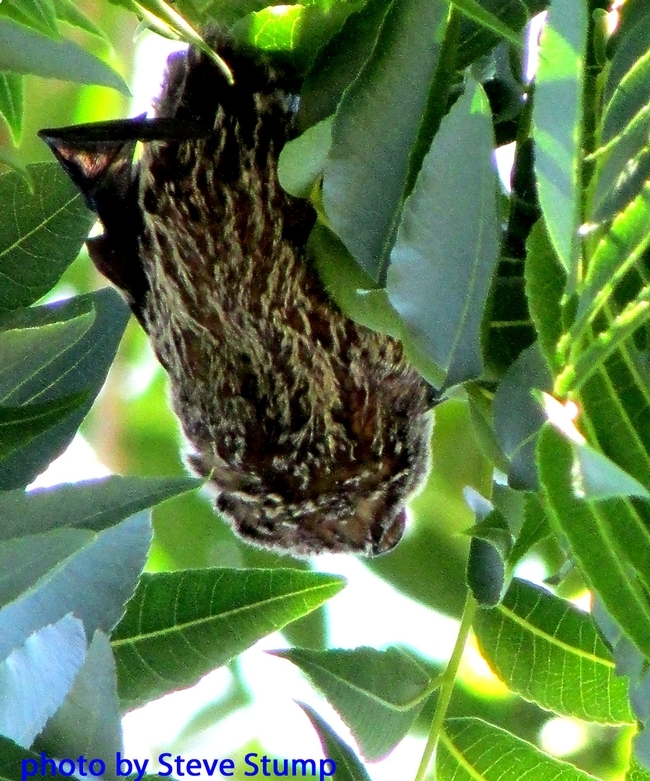 This bat, which summers in North America and winters in South America, is a loner ... normally roosting alone on trees, in tree foliage, or occasionally in caves. The Hoary Bat prefers woodland habitats, especially coniferous forests, but they do apparently use oak woodlands to some extent. This bat likes to hunt for moths over open areas or water bodies. It has a fur coat that is dark brown with an overall "frosting" of silver-white and hence the name "Hoary" which means having white or gray hair, as if which age. The genus name Lasiurus is derived from the two Greek words of lasios, which means "shaggy" and oura, which means "tail". This refers to the fact that the bat's fur extends across the tail membrane. This photo was taken by a friend last week near the Russian River as it was flying during daylight hours and then landed in a black walnut tree. It is known to occur at HREC, but its use of habitat types on the Center is still a bit baffling. Of side-note interest ... this is the only mammal species that found its way to the Hawaiian Islands. Yes it is! You should come visit! Hannah Bird: Yes it is! You should come visit!